The Germantown Plan for the Town Sector Zone master plan will update the community’s Town-Sector (T-S) zoning to reflect current zoning classifications. In October 1968, the T-S zone was approved for the entire Churchill Village community through Zoning Application No. F-148. This zone provided the mechanism to build a planned “new town” on 1,500 acres of largely undeveloped land. Such towns, to the extent possible, were to provide all the land uses needed to make a community reasonably self-sufficient, except for major employment and central business district shopping. The T-S zoning approval included a 50-year sunset provision, after which time the prohibition on new zoning applications will cease. This sunset provision expires in 2018 and is the primary reason for this master plan. The master plan boundary map includes all land currently zoned T-S in Churchill Village. Planning staff will work closely with stakeholders to engage, analyze and prepare a master plan that reflects the community’s vision and goals. Staff’s recommended approach is to propose zones that best reflect current land uses and densities as closely as possible. For instance, the large portions of Churchill Village that are exclusively residential would be recommended for single-family, townhouse or multi-family zones that mostly closely reflect those existing housing types. Existing non-residential development would receive a zoning category similar to its current non-residential land use. Apart from one 4.75-acre vacant parcel at Waters Landing Drive and Father Hurley Boulevard, all available land has been developed or is reserved for open space. Therefore, proposals to redevelop land or increase residential or commercial density are not expected. All existing open space and recreational uses are to remain protected. 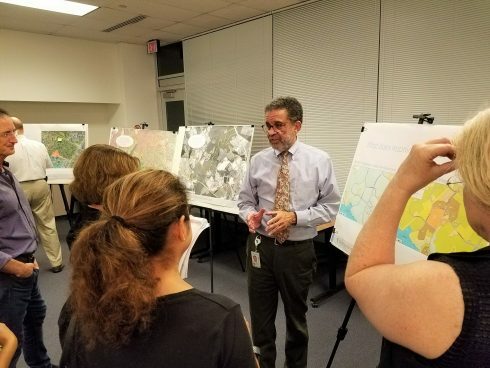 At the first community meeting, the Germantown Plan for the Town Sector Zone team provided a presentation about the master plan process, the purpose of the master plan, and summarized the potential new zoning classifications in the plan area. 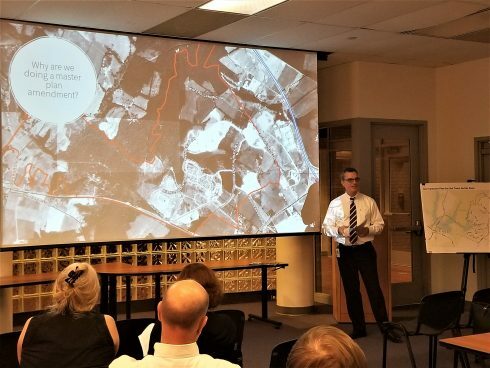 Residents and stakeholders questioned how rezoning might affect residential and commercial property, and what might happen to undeveloped land. After the presentation, an open-house meeting with staff provided more opportunities for participants to further discuss their questions and thoughts. On November 29, 2018, the Planning Board approved the Scope of Work, which outlines the planning framework, goals, approach, community outreach plan, and project boundary map. Planning staff will now move forward with preparing a proposed zoning map and present its recommendations to the community in early spring 2019. The Planning Department held an open house to discuss the master plan preliminary recommendations for new new zones in Churchill Village. Residents, property owners and anyone with an interest in Churchill Village were invited to participate. Planners provided a presentation of their preliminary recommendations and discussed an opportunity for infill development at Father Hurley Boulevard and Waters Landing Drive. Participants raised questions about potential zoning, density, open space, recreation, as well as the planning process and future opportunities to participate. After the presentation, planning staff reviewed poster displays with participants, and conversed about the master plan and other land use matters affecting Churchill Village. Community outreach, analysis, and development of Scope of Work. Community kick-off meeting and open house at the Upcounty Regional Services Center. Planning Board approved the Scope of Work. Community open house at the Upcounty Regional Services Center to present preliminary staff recommendations and elicit feedback. Staff will present preliminary recommendations to the Planning Board. Planning Board public hearing and work sessions. Commission adoption and Sectional Map Amendment. Stay up to date with the Germantown Plan for the Town Sector Zone.